Penta Server.com maintains an unparalleled, fully redundant network. 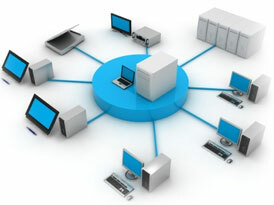 The Penta Server.com network is a state-of-the-art purpose-built hosting environment. With superior diverse fiber connections brought into our data center via multiple long haul Gigabit Ethernet providers, we confidently back our network services with a 100% Uptime Guarantee. Penta Server.com guarantees that our network will be available 100% of the time (excluding scheduled maintenance). Should we incur a network outage, Penta Server.com will credit the customer 5% of their monthly fee for every 30 minutes of downtime. Fully redundant routing and switching executed with Cisco routers and Juniper firewall hardware. 100% Gigabit Ethernet Internet connectivity from 5 diverse carriers (multi-homed, diverse fiber connections). Total Internet transit capacity of 5 GB/s more than double total throughput at peak times. All Internet connectivity delivered over diverse facilities to eliminate any customer impact in the event of a fiber disruption. Penta Server.com maintains 24x7x365 proactive monitoring of our network by a highly skilled and specialized professional Network Engineering Staff. Our support systems allow us to prevent and remedy issues before they can impact your business. Our Network Engineers are available at any time, day or night, to assist with a network, firewall, or connectivity issue. With over 100,000 square feet of data center space (and growing! ), we provide custom cabinet, cage, suite and circuit configurations. Redundant UPS (Uninterruptible Power Supply) systems and back-up generators ensure our data centers and clients never lose power. Tier one connectivity from multiple providers gives clients the connectivity and speed they demand. Penta Server.com's Smart Design Standards for airflow management guarantee a stable temperature and humidity. Unmarked facilities, biometrics, video surveillance and three layers of NOC monitoring provide our clients with the highest levels of security.